Calling all aviation enthusiasts and Brisbane historians, allow extra time on your next trip to Brisbane Airport to visit the Kingsford Smith Memorial. This memorial is dedicated to the early Australian aviator Sir Charles, best known for making the 1928 first trans-Pacific flight from Oakland, California to Eagle Farm in Brisbane. 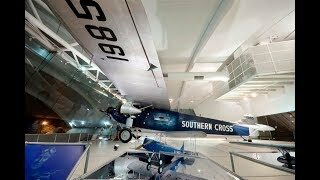 The preserved “Southern Cross” aeroplane is on display at this memorial, and Brisbane Airport is the custodian of this important relic for the Commonwealth of Australia. The best way to tour the centre is through a self-guided tour of the information boards, or via the voiceover system that tells the story of the Southern Cross. This memorial is completely free and open 24 hours a day, seven days a week so visit on your way to the airport or if you need to wait to pick someone up.